One day in fourth grade I sat down to copy our spelling list from the board. But I couldn't see any of the words on the board clearly. Everyone else was scribbling away. And I was kind of panicking. I kept getting up to "sharpen my pencil" and "get a Kleenex." Then I would memorize as many words as possible, go back and write them down. And just like that I needed glasses. Recently I was diagnosed with Ocular Hypertension. One thing I am trying to do to give my eyes a bit of a break is wear my glasses more. I adore my glasses. I just got them recently, and my only complaint is the cost. Even with insurance, my high prescription=high cost. Enter GlassesUSA.com. They offer high-quality discount eyeglasses at the most reasonable rates I've seen in a while (cheap price, but not cheap frames, that's for sure). Just looking around their site I was seriously tempted to cave and buy a few pairs. They have this really fun feature called the Try-It Mirror, that lets you try glasses online. I was able to see how I look in designer glasses, retro glasses, plastic, metal, rimless, and even men's frames if I wanted (heehee). I'm a little surprised they don't have monocles! We aim for a friendly return policy. Our customer's satisfaction is guaranteed. But if they aren't satisfied for any reason, they can return the glasses and get a one-time exchange or in-store credit. If a refund is requested, we will refund 50% of the cost unless there was a defect on our end. The bottom line for us is that we want a customer to be satisfied with our glasses so we will do what we can to make sure you're happy with our frames. So far, our customers have been happy with what they've received and we check to make sure the glasses are aligned properly before they are shipped. So instead of spending too much time or money at an eyeglasses store, go try on a few pairs at GlassesUSA.com. Watch out...it's a little addicting. And if you find some you like, you can get 15% off by clicking on that fancy little button over there in my sidebar. Nothing like high quality cheap eyeglasses! This is a sponsored post by GlassesUSA.com. ugh! I need to get my eyes checked as well. I haven't had an eye exam since Luke was born—I think it has been around 5 years. I like the way I look in glasses, but I can't stand the way they feel on my face. I like the red ones, black, and the bottom 2 toned pair. Funny faces! I have a website for you too! I'll put it on my blog. Sometime. Those are great choices! I love them all... so stylish. I've been entertaining the idea of glasses to see if I can reduce glare, especially at night when I'm driving. I can feel my eyes changing on me! Thanks for the recommendation on where to go for options! with your cute haircut...i think any glasses would look cute on you! 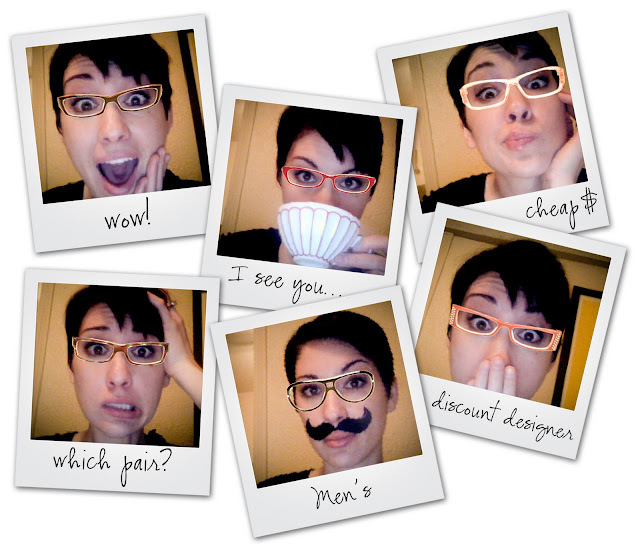 You need to check out www.warbyparker.com. They have awesome designs, they send you up to 3 pairs to try on before you buy, and they have monocles! I'm going to see you soooooo soooon!